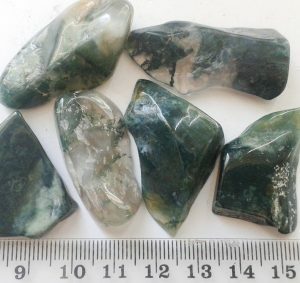 History/Mythology: Due to the plant like inclusions Moss Agate has always seem to have a connection to nature and nature spirits. Moss Agate is a white form of Chalcadony that has green inclusion (iron silicate). Moss Agate is a wonderful abundance stone as it attract wealth and prosperity into ones life. It is a great stone to use when you are having any issues relating to the heart as it opens up your Heart Chakra with a very comforting and supporting energy that assist with depression issues. It is said to have a very strong connection to the Delvic Kingdom (Earth Spirits and Energies) and is wonderful to help bring nature into balance and to help start and retain new growth. Due to its vibration that assists with new beginnings it is also a great stone to have during a birth to help make it safe and supportive for all involved. Healing – Brain imbalances and inflammation like Alzheimer’s, immune boosting, lowers fevers and assists in cases of infection, helps with inflammation issues, Lymphatic system and memory loss. Moss Agate makes a wonderful abundance pendulum that can be worn on a regular basis. Can be used in all meditations especially when working on issues of the heart. Midwives and Mothers to be will benefit from using Moss Agate particularly during the birthing process. Moss Agate makes a good stone to wear or carry around particularly for people who work with or spend a lot of time in nature. Place Moss agate around pot plants or in nature areas in order to help restore and keep the balance and promote growth.